The following is an excerpt from the article “Identification and Classification of the Existing Animal Motifs in Indian Timurid Carpets “ by Rezvan Ahmadi Payam and Mohsen Marasy. While being the oldest in terms of antiquity and the most sophisticated in terms of design and composition, these carpets contain the most ambiguous variety of Indian carpet motifs. In these carpets, a collection of Indian animals and birds with monstrous masks, vases and flowering plants are combined in a complex image. On a wine red background, animals and birds with horrible masks are depicted while emerging from the mouth or the forehead of each other. Some researchers regard these figures as symbols of fertility and fecundity. The oldest of these carpets date back to the period of Akbar’s reign. The primary pattern for the intricate animal complexes in the carpets with imaginary animal motifs could be a combination of the Makara and Kirtimukha figures. Makara is a mythical sea creature that was originally portrayed as a crocodile. This creature was depicted as a biped or sometimes a quadruped dog-like animal. In the artistic works of the Gupta period, the Makara was portrayed with a decorative tail. The Kirtimukha monster face is a combination of a lion and a strange sea creature with no lower jaw and is similar to a hanging skull. However, the powerful and lively lines on its face breathe life into this imaginary figure. As Kirtimukha breathes heavily through its nostrils, flower strings outpour from its muzzle. One of the prominent characteristics of the Makara and Kirtimukha figures is that they are usually combined together and portray the acts of clawing and biting. Another pattern used in the carpets with imaginary animal motifs is the one that became prevalent during the reign of Jahangir, the eldest son of Akbar. 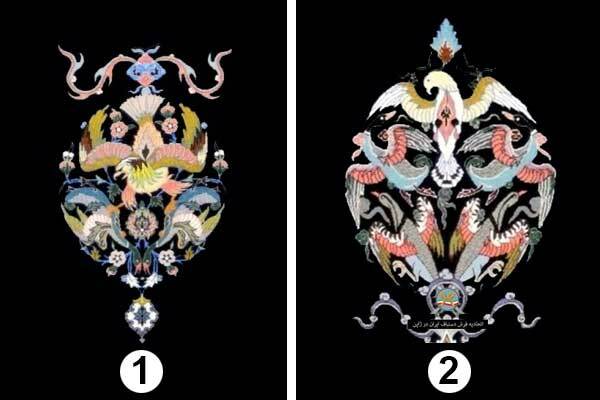 This pattern is vastly different from the older examples and includes motifs portraying the heads of different animals (lions, deer, foxes, elephants, and some birds) in a swirling structure distinct from the ones that depict plants. Moreover, the combination of animal faces, which is common in carpets woven during the reign of Akbar, is not seen in this pattern. However, unusual animal faces still exist in the form of “Vagh” motifs. Vagh is a tree whose fruits are in the form of the humans and different animal species. Vagh motif is evident in carpets woven during the reign of Jahangir. 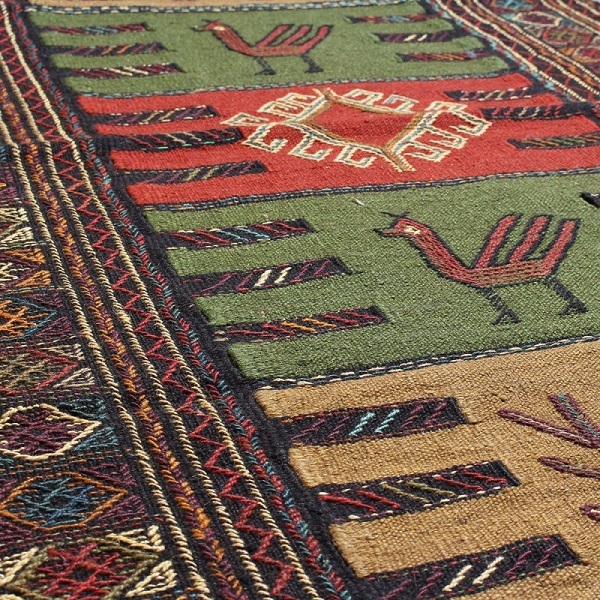 A similar structure is also apparent in Kashan carpets dating back to the 10th century AH. What is considered as the distinctive feature of Indian carpets, other than the portrayal of unusable figures, is the creation of naturalistic depths or forms. In spite of the poor design, the artists created their desired naturalistic effect by using several color shades and drawing one or two lines among the animals’ main body color. 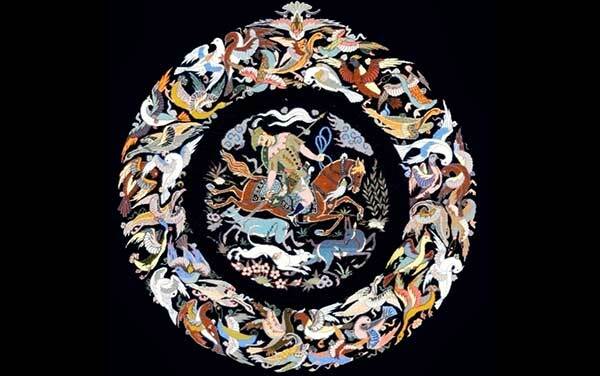 The second group of carpets depicting animals are the ones with pictorial motifs. These motifs are scenes that divide the carpet backgrounds into separate picture surfaces with different themes and are not symmetric, neither crosswise nor lengthwise. Like other carpets woven during Akbar shah’s rule, these carpets are heavily reliant on both realistic and imaginary aspects. 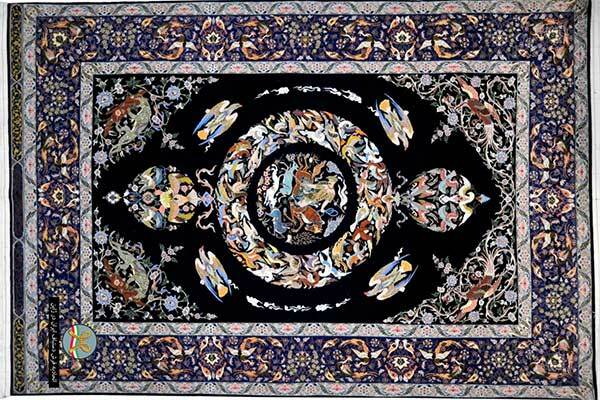 An example of carpets with pictorial motifs is kept at the Museum of Fine Arts, Boston. This example contains three separate scenes. The part at the top depicts a scene from the court. The part in the middle illustrates the everyday life (a scene of cheetahs being hunt). Lastly, the part at the bottom portrays a mythological scene (a hybrid creature being attacked by a bird). The space between these scenes is filled with capering animals and scenes of the combat between a lion and a bull. A great number of Indian carpets woven during the reigns of Akbar and Jahangir have motifs based on swirling vegetal elements. Vegetal carpet motifs are pictures inspired by Nature. The richness of these carpet patterns is augmented by the addition of the animal motifs to their network of swirling branches. The carpets with the aforementioned motifs primarily date back to the first quarter of the 17th century AD and the period of Jahangir’s reign. These carpets were woven based on the Sanguszko Persian carpets of the Safavid era. Unlike the Persian carpets, the Indian example, which belongs to a private collection, is symmetrical crosswise and contains particular patterns each repeated for three times. Animals, depicted either individually or in combat can also be observed among the twisted branches of Khataee flowers. In the Islamic art, each design and pattern has an internal meaning in addition to the theme and superficial beauty – a meaning that represents the conscience and mind and if the viewer goes beyond the superficial beauty, they see the internal elegance. Beauty is internal and beyond the viewer’s mind. Talented artists with spiritual worldview instill a specific feeling into the viewers – a feeling which whispers the flow of entity. 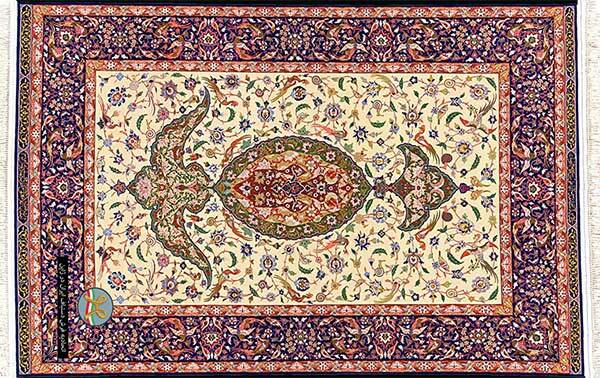 This exquisite carpet has 3 borders: a wide border, two small borders and a background. The background is designed by Corner Medallion design with Sky Hunting theme which includes spiritual and philosophical themes. 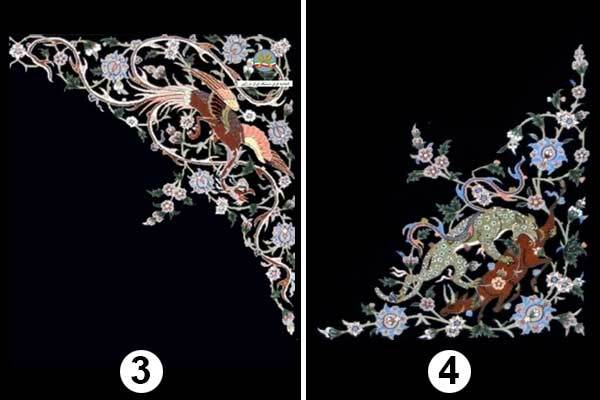 If we imagine ourselves in the sky looking down while looking at this design, we can see the stunning human and animal’s hunting scene on the ground designed in the center of the carpet or Medallion with the Animal’s Combat design or Tasheer, which is the raised designs of the Islamic art. A horse rider whose hat looks like those of Safavid periods is busy hunting and having fun and has the central role. Islamic lines, among these illustrations, are the vicissitudes of life which can be seen as Islamic spirals or clouds and bushes. Next to it, there is another circle visualized with beautiful colorful birds swirling in a rotary way because “circle” is the sign of time and symbol of constant and circular motion of the sky and is representative of the cosmic sky. Circle with its dynamic motion is the indicator of change. In the third circle, there are three hawks swirling around a circle of birds. On the head of the Medallion below, there are two birds captured by an eagle and their heads are downward and since they have been busy with earthly delights, they have fallen to the bottom and are captured by predators. On the head of the Medallion above, there are four birds under the umbrella of Prosperity Huma bird and these birds are looking upward and thinking about ascent. 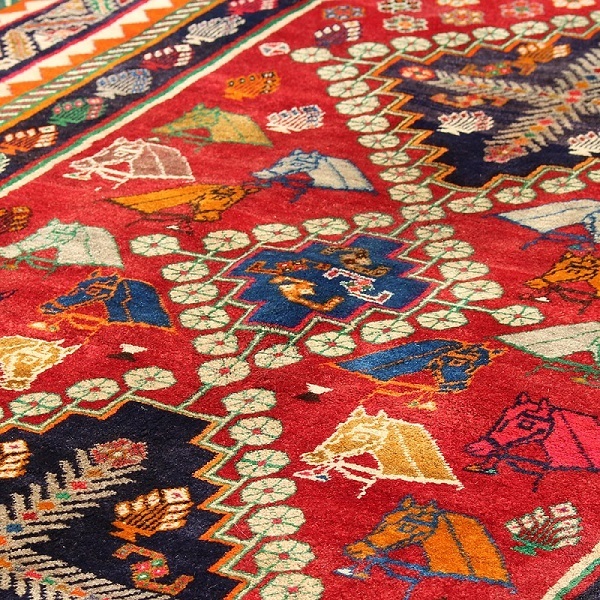 In the corners on the upper part of the carpet, the design of Phoenix or Prosperity Huma bird among flowers and “Xeta” leaves has been illustrated. Two corners at the bottom of the carpet among flowers and “Xeta” leaves can be seen with the Animal’s Combat design/ Tasheer and the prey has its head downward and does not look around to escape and does not see “ascent” and has been captured. Bird signifies freedom and liberty and the triumph of good over evil, prosperity and good fortune, annunciation of spring, fertility, asking for rain, etc. The carpet enjoys skillful designing and color scheme. The contrast of warm and cool colors dominant over the carpet’s color scheme which intensifies with the contrast between dark and light colors is effective in emphasizing the details of the design. The first version of the woven carpet using this design is ornamenting Tehran Museum of National Arts in 1975. The second copy of this carpet is kept in Isfahan Museum of Decorative Arts where the late Master taught for several years. 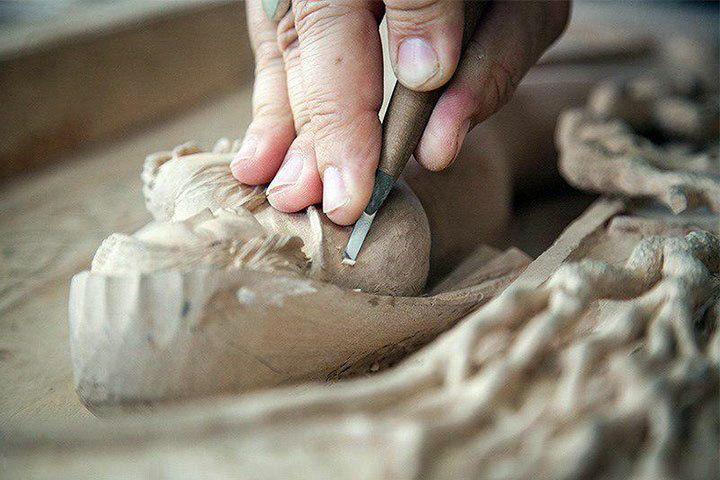 The third copy (the re-woven version) was contributed to the Imam Reza (PBUH) Shrine which is now being kept at Carpet and Textile Treasure in Astan Quds Razavi. The Carpet of Mankind is an exquisite masterpiece which has summarized the philosophy of life and longevity in form of 3 stages of human life. These triple designs are somehow reflective of the life of mankind (I was naive, I became experienced, I got burned). On the upper head of the Medallion, two weak children have been designed who are standing back to back in order to gain power and get up. The center which is the Medallion of the carpet is youth and becoming experienced. Young and lively figures are enjoying youthful exuberance and there are two protagonists at the bottom of the Medallion who have reached the end of their lives; they spread-eagled on the ground while leaning against each other. These figures have skillfully been designed and animated with flowers and Xeta leaves. This carpet lacks corner and enjoys skillful color scheme and design. The contrast of warm and cool colors dominant over the carpet’s color scheme which intensifies with the contrast between dark and light colors is effective in emphasizing the details of the design. There is an inscription woven at the end of the carpet which says: (Isfahan, woven by Gholam Ali Haghighi, designed by Bahadori, 1975) and this also reads in front of it, on the top of the carpet: (dedicated to Holy Astan of Imam Alī ibn Mūsā ar-Riḍā (PBUH)). This carpet is woven and dedicated, in memory of Haj Gholam Ali Safdarzadeh Haghighi, by his son Haj Ghola Reza in 2008. This carpet is, at least, the third copy of Master Isa Bahadori’s design. The second copy is for sale and is kept in the Museum of National Arts. Another version of this is in Isfahan Museum of Fine Arts where the late Master Isa Bahadori taught for several years. Iranians since ancient times, have cared about their health and nutrition. That is why they used to design their food plates. 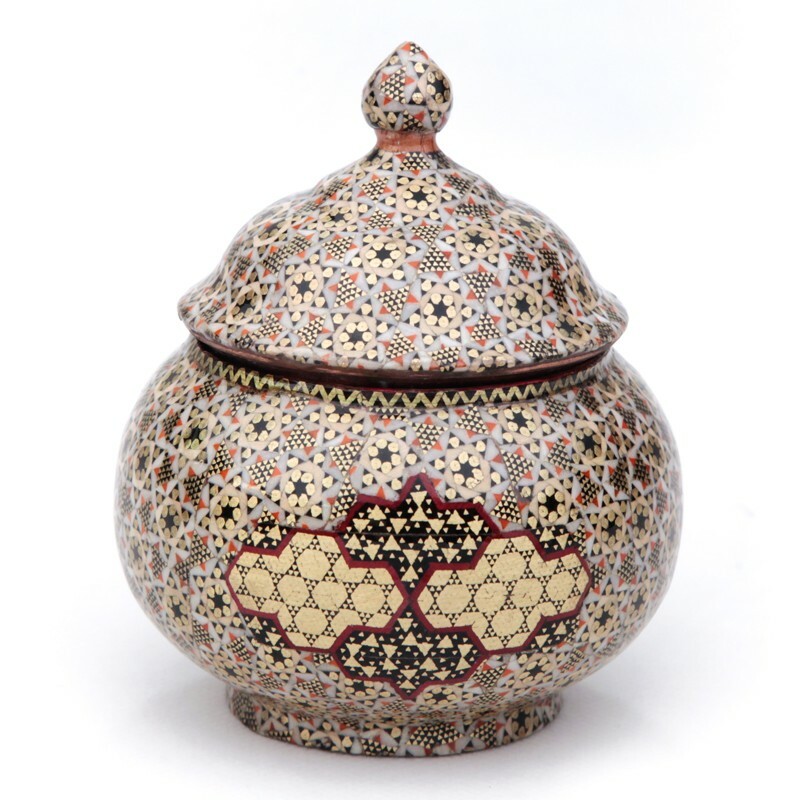 It can be understood from the motifs on traditional containers. It’s also seen that they sometimes portrayed the stories of wars and victories on their plates. There are numerous figurative patterns on old dishes that was simply designed. These days motifs of old containers are reminiscent of civilization of nation used them, and for some of us these patterns are symbol of our predecessor’s dignified life or moral values. Maybe that is why having them gives us a good feeling. 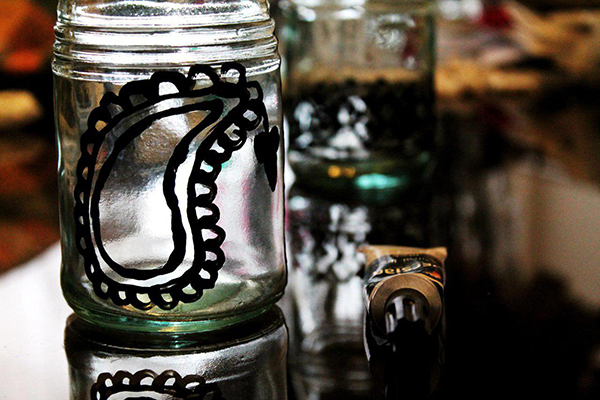 In this post we want to show you how to make a pot by using a glass bottle and paste. 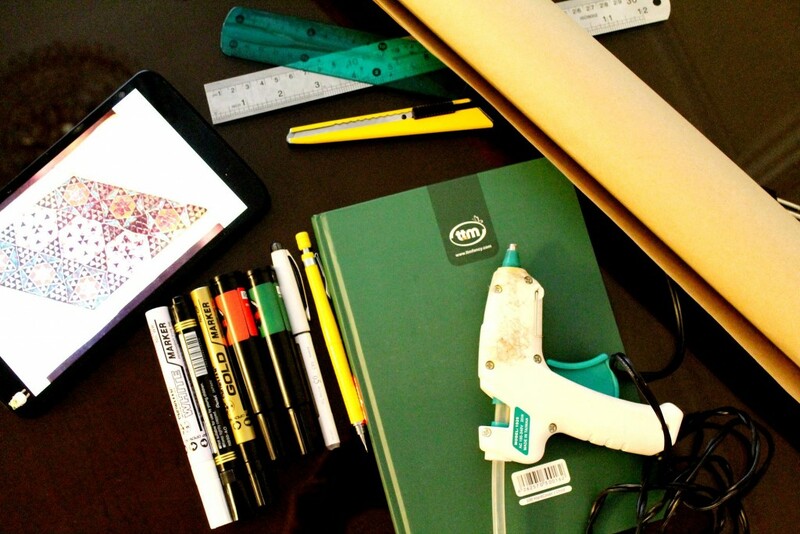 you can use any pattern you like to design your pot. after you prepare all you need its time to choose a pattern. you can select traditional pattern that was used in ancient times. the design that bring a rustic nostalgia to your decor. let me show you some Iranian patterns that are from 17th and 18th century. First picture is design of potteries belonging to the seventeenth century and second Picture is images of tiles belonging to the eighteenth century. 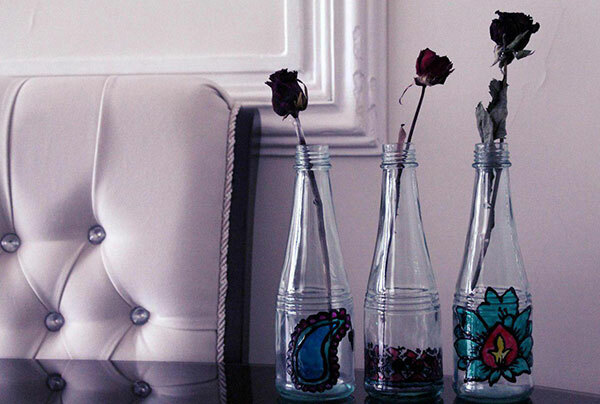 First of all draw your pattern on glass bottle by using paste. 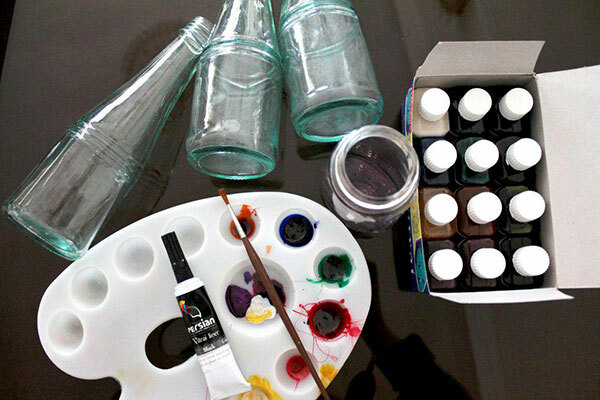 If it’s not easy for you to draw with paste on bottle first draw it with pen or try it on another glass and when you are sure that you can do it, try it on the glass bottle. Then wait until the paste becomes completely dry. Now you can pain it according to your taste. after the paints become dry your bots will be ready. Enjoy your Iranian patterns.